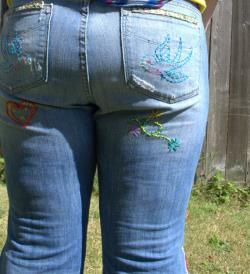 The jeans pictured are an example of what can be made and are not for sale, please read entire listing to order your own custom pair. Patchwork and embroidered jeans have been a staple since woodstock in '69. 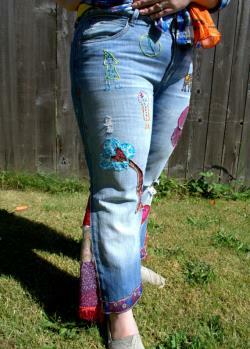 From patches, to flowers, to embroidery, embellishing jeans is not only cool and funky, but extremely unique. These jeans are carefully sewn, 90% by hand, with only a few small pieces sewn on the serger and machine around the leg for clean finishes. These jeans are truly unique. Now it is your turn your very own jeans into a technicolor pair of dream pants. Allow 3 weeks from the time your jeans arrive to me for completion. We can discuss your measurements. However, for best fit and comfort i recommend sending your own jeans. Loser jeans work better than super tight jeans. 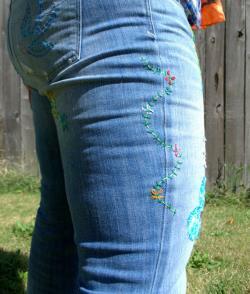 You may choose up to 8 small -medium embroidered designs for your jeans. Below are only some of the designs i can embroider. If there is something on the list you do not see, just ask and i will let you know if it is something i can design. Gnome like dolls(see on above jeans). Fabric cutouts , choose up to 2. 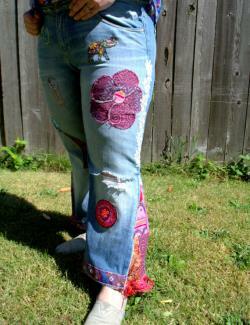 Examples are seen on pictured jeans e.
Large fabric flower, fabric tree. 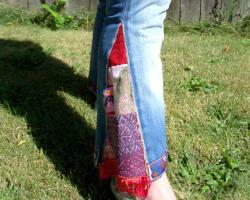 Choose to have fabric added to lower leg for bell bottoms, also choose color of ribbon for lower leg.